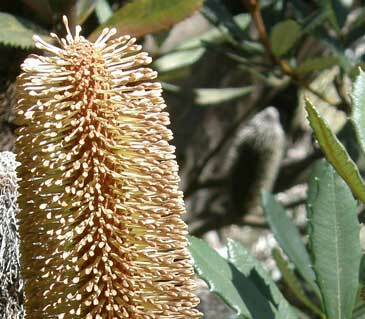 There are currently nine Banksia species in the Greater Blue Mountains. This number changes as species are reclassified as subspecies and vice-versa. 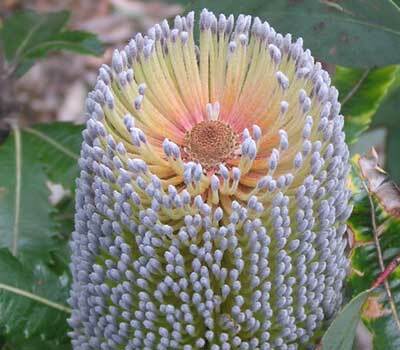 Banksias vary within a species and hybrids can occur. The first lesson is to disregard juvenile leaves - as they can be vastly different to the mature leaves used to identify plants - as this image of the seedlings of a Heath-leaved Banksia shows. 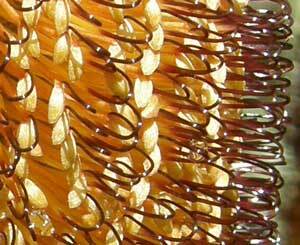 A detailed profile of each Banksia and how to identify it can be found below. Here's a simple field guide. 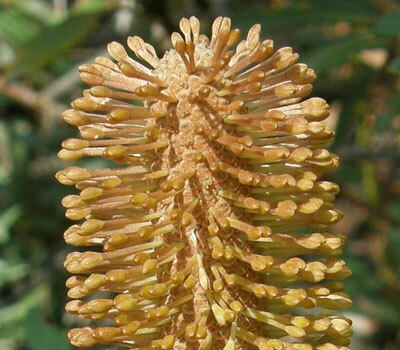 The botanical detail on this webpage comes from PlantNet (New South Wales Flora online), plus extensive observation of the differences in species, and seeking out the less common Banksias. 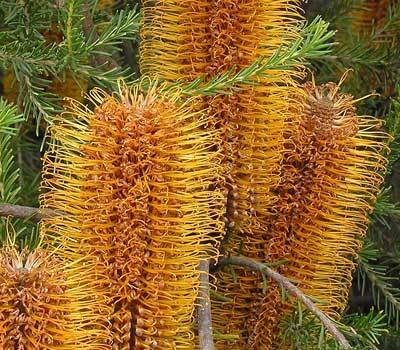 Banksias were named after the botanist Sir Joseph Banks, who was aboard the Endeavour when it anchored in Botany Bay in April 1770. Here's a list of the plants collected at Botany Bay in 1770. Lignotubers are a woody swelling, partly or wholly underground, that allow the plant to regrow after being savaged by fire or earth moving equipment. Banksias that are multi-stemmed most probably have lignotubers. This can be used to identify a species. 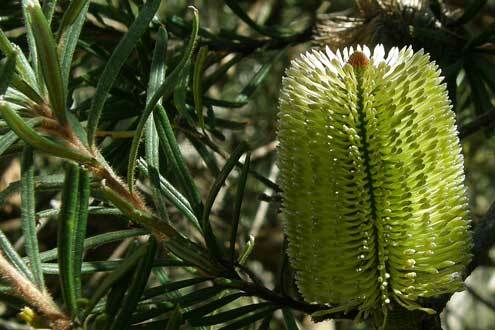 Epicormic buds produce new growth from the trunks and branches of some Banksias after burning or slashing. The seed capsules of Banksias open with heat (such as a bushfire). Whereas other genera of the Proteaceae family open as soon as they form (Waratah), or when the branch supporting it dies (Hakeas). A Banksia with open seed capsules is a sign that a bushfire has been through the area in the past few years. Conversely, a Banksia with closed seed capsules indicates that a bushfire hasn't been through the area since that cone was formed - which may be many years. separate these three Banksias from the other six. Their leaves then distinguish them from each other. A tall dense shrub to small tree; it has orange candle like cones in Autumn. 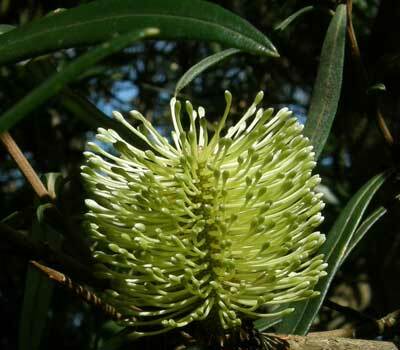 B. ericifolia was one of the three Banksia species collected on the 1770 Endeavour voyage and classified in 1782 with the description "Habitat in Nova Hollandia. J. Banks." 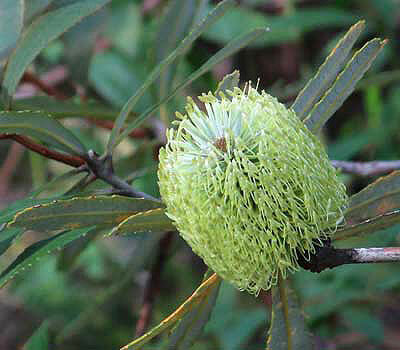 The subspecies in the Greater Blue Mountains is Banksia ericifolia subsp. ericifolia. This subspecies is found on the coast from Sydney to Jervis Bay, and the ranges from Rylstone to Moss Vale. 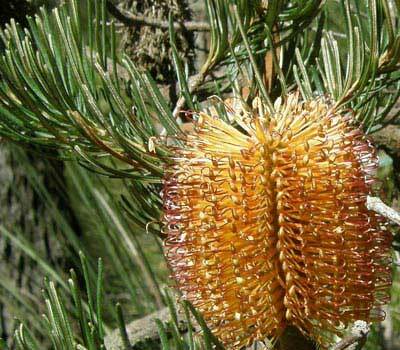 The Heath-leaved Banksia is often killed by fire and then does not regrow from the same plant but from seeds in the ground. A small multi-stemmed shrub usually less than 2 metres in height. Its recurved 2mm wide leaves identify it. The leaves tend to be clustered at the end of branches and point upwards like fingers on a hand. This species has had various varieties over the years including collina, cunninghamii and neoanglica. These are now all classified as distinct species. This species is widespread and is found on the coast and ranges from Victoria to Queensland. The Hairpin Banksia has a lignotuber from where it regrows after fire - which explains its multiple stems. 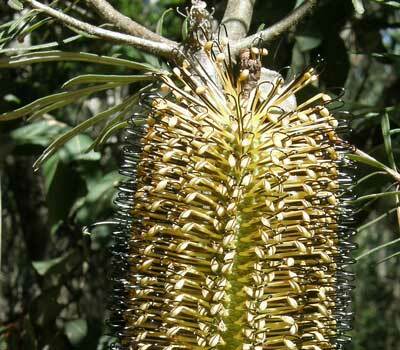 Until recently it was known as Banksia spinulosa var. cunninghamii. A single stemmed tree up to 6m in height. Its 5mm wide leaves radiate from its branches, and are reasonably flat and are toothed towards the end. 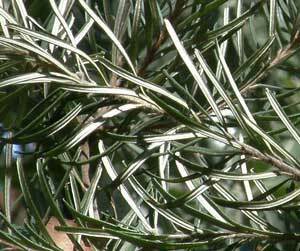 I find it hard at times to distinguish it from Banksia spinulosa - no wonder it was a variety for such a long time. This species grows chiefly on the coastal ranges from Victoria to Queensland. Banksia cunninghamii does not have a lignotuber and therefore doesn't regrow after fire. This explains its single stem. The three species are uncommon. A small shrub to 2m, its whorls of leaves help identify it. However, plants can be found that have scaterred leaves and margins can be entire. have a main rib vein that isn't as hairy. This subspecies is found on the coast and ranges from Sydney to the Victorian border. Banksia paludosa subsp. paludosa has a lignotuber. 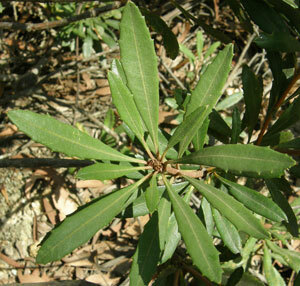 A large shrub to 4m in height, its whorls of leaves help identify it. have a main rib vein that's hairy. It is restricted to small populations in the western Blue Mountains - primarily the Newnes Plateau - where it usually grows in rocky escarpment terrain. The Newnes Plateau Banksia does not have a lignotuber. Here's a great image of its cone. A tall leggy tree to 25m that grows in forests on soils derived from igneous rocks - such as on basalt at Mt. Wilson. Its whorls of leaves, leaves themselves and small light yellow cones help identify it. This subspecies is found along the ranges north from Mt. Wilson and into Queensland. It regrows after fire from epicormic buds. The Coast Banksia (Banksia integrifolia subsp. integrifolia) does not occur naturally in the Blue Mountains, but has been introduced in settled areas. There's several magnificent mature Coast Banksias at Bullaburra Station. The three species are common. Once you see its straight styles and scattered leaves, the rusty hairy under surface of its 7cm long leaves and branchlets identifies it. Its bluish perianth also identifies it. It's a 2-3m high multi-stemmed shrub which can regrow from its lignotuber. Its new growth is spectacular - leather like in colour and texture, but soft to the touch. The Fern-leaved Banksia grows along the coast and hinterland from the South Coast of NSW into South-East Queensland - plus the Greater Blue Mountains. It gets its name from the underside of its leaves which are white and shine in the sun. It is similar to the White Mountain Banksia (Banksia integrifolia subsp. monticola) but its leaves are scattered along its stems and have a blunt tip which often has a mucro (a small projection). 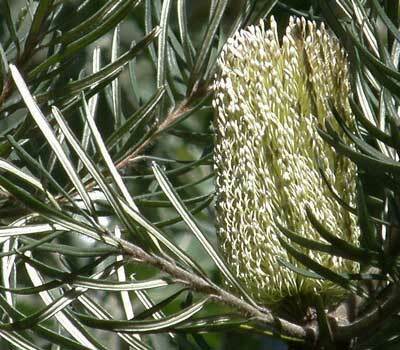 The Silver Banksia is widespread along the coast and ranges and non-arid areas from northern NSW through Victoria and into South Australia. It is also found in Tasmania. It may or may not have a lignotuber. Growing up to 16m in height, it is easily recognised by its gnarled trunk and its shiny serrated leaves and velvety tactile new leaves. Old Man Banksia is the first local Banksia to flower - as early as December. I don't share May Gibbs' view as it being a Big Bad Banksia Man, but rather as the old sage of the forest. Here's Old Man Banksia covered in morning dew.